At AGS Records Management Swaziland, we will take care of the entire life cycle of your company’s records. We have over 30 years of experience in Records Management worldwide and will deliver a professional, stress-free service that ensures the safe keeping of your company’s documents. Located in Lobamba, AGS Records Management Swaziland is part of the AGS Group, a leader in Records Management in Africa. 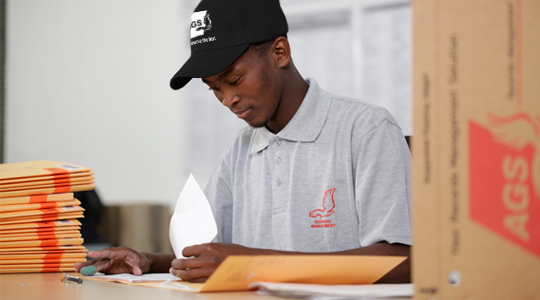 We’re trusted by companies in Swaziland and around the world to take care of their most confidential documents throughout its life cycle – from physical records management and electronic archiving, to its destruction. By choosing AGS Records Management Swaziland you choose a worldwide leader in records management.